ACLU Jews Sponsor Lesbian Statue In Park! ACLU JEWS SPONSOR HOMOSEXUAL-LESBIAN SCULPTURE IN GREENWICH VILLAGE NY’S CHRISTOPHER PARK! A HOMOSEXUAL-LESBIAN SCULPTURE called the “Gay Liberation Monument” in Christopher Park in Greenwich Village NY is one of the first such “Gay Life Style” public monuments sponsored by the Jewish-led & funded ACLU. While the Jews of the ACLU are working around the clock in every State to take down public monuments of Christian Crosses, Nativity Scenes, and Ten Commandment Monuments, many see this “Gay Rights Monument” sponsored by the ACLU Jews as the first of many to come throughout America. But the Jews were cursing me and threatening me with violence. One big Jewish man went into a rage and knocked me down from behind. But I kept my cool and continued with my protest, carrying my sign throughout Wall Street. The Jews of the ACLU must be stopped. We must all speak out in protest of the jewification & de-Christianizing of America before it is too late! 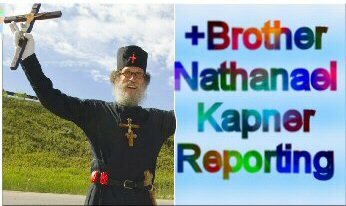 Br Nathanael Kapner; PO Box 547; Priest River ID 83856. Many thanks in advance! Unbelievable! This would be laughable if it wasn’t so totally disgusting. Hm, If I were anywhere near that park I would be very tempted to break the heads of the statues with a sledge hammer and throw a bucket of read paint on them! That is absolutely one of the most disgusting things I have ever heard of! America has fallen to pieces when we’re dedicating “monuments” like that to such a disgusting abomination people are calling a “lifestyle choice” these days! I’m appalled! Good Christians should march together and dethrone these putri statues, what a mockery and an insult to our good Christian nations, enough is enough, these vile anti Christs who call themselves Jews need to be dethroned all around the world….Rise good Christians and bring such repulsive things to an end…The power lies with us. Those filthy statues look like they are covered with hardened brimstone!! Sodomite lifestyle is yet one more gift from the Jews to destroy our culture!! They are destroyers of nations and cultures. Time to add one more expulsion order to that hypocritical group! Most lesbians are miserable and nasty. Don’t even worry about what they do, they are miserable and unhappy. I am happy to live in China, we are better then this. How can America, once a proud and free nation fall in to Jewish hands? I believe that the Holocaust was made up and that 911 was a bunch of Jews behind it. We struggle to become developed, but when we are, and we have, a better nation then yours, unless you send the Jews to Israel and ban them forever. There can be no doubt that the Talmud is the dark and evil side of society. We who wish to stand against the fruits of darkness are mustering up a weak counter war. We must make a comprehensive study of the New Testament and stop cherry picking Bible verses then running in the heat of the day with no water to drink or understanding of it’s whole content. Who the enemy is has been clearly spelled out in the Bible but we fall for lack of knowledge. We must study as much as our enemy studies or we loose the spiritual battle. They dominate US professions, they control most large corporations, especially banks. They control Hollywood and the liberal media. Israel, our “ally,” spies on us and is very devious. They get financial aid from us when we need to borrow from China. If you had to borrow money to live on, would you be contributing to charities? Anyone who dares to out them is “anti-semitic,” (like darkies and the race card!). Our currency is not even our own, it’s the Jew Rothschild’s. Why do you think Hitler singled out the Jews? Because they had a stranglehold on the German economy. And this is what is happening in Amerika today and around the world! I have a bit of Jewish blood running in my veins and have Jewish children born of a Jewish wife. However, I cannot condone the actions of the filthy Zionist sect in Israel and those in the American media and politics. They are the world’s leading abomination. When will they be out of our lives? Lord, please have mercy on us! We are near the end of our destruction. I had many Jewish friends in my young age from all walks of life. The Nazi propaganda did not influence me. But recent events observed in the media with the Zionist promotion turned me OFF! However knowing who controls the media in the world today at my age (93) I have to admit that they are the winners.